NEW YORK, NY (24 April 2019) – The Caribbean Tourism Organization (CTO) will present its “Award of Excellence” to Gay Nagle Myers, senior editor for Travel Weekly, for her compelling and influential stories that effectively communicate the allure of the Caribbean. The prestigious award recognises journalists and travel writers whose coverage of the region over an extended period has been par excellence. Myers will be honoured during the Caribbean Tourism Industry Awards gala which recognises exceptionalism in promoting the Caribbean and honours individuals whose outstanding, passionate and dedicated work has contributed to the development and success of the region. The esteemed awards dinner takes place on Thursday, 6 June from 7 – 10 p.m. at the Wyndham New Yorker (481 Eighth Avenue) during Caribbean Week New York (#CWNY2019), when the Big Apple is captivated with Caribbean flair, pulsating energy and colourful sounds. Myers is the Caribbean editor for Travel Weekly and has been with the publication longer than most of the hotels she writes about have been welcoming guests. She reports on, and travels to, sun, sand and sea destinations on the tourist circuit and off the beaten path. Myers joined Travel Weekly in 1985 after several years as a writer and publisher for other leading travel publications. “It is with both respect and admiration that the Caribbean Tourism Organization recognises Gay for her drive and commitment to positioning the Caribbean as a charming and important region,” said Sylma Brown, director, CTO-USA. “This is just a small way of saying ‘thank you’ for the contributions she has made over the years, bringing the region to readers through her creative writing pieces,” she added. In addition to the Award of Excellence, CTO will present the Caribbean Travel Media Awards, the CTO Allied Awards comprising of the “Jerry”, the Allied and a Special Recognition Award, the Diaspora and Lifetime Achievement awards, as well as the Jamaica-sponsored Marcia Vickery-Wallace and Marcella Martinez memorial awards. Tickets for the dinner can be purchased online only via https://www.caribbeanweek.com/events/caribbean-tourism-industry-awards-dinner/. Caribbean Week New York is the largest regional tourism activity in the New York area. Artistes, performers, celebrity chefs, the Diaspora, investors and other strategic partners join government officials and the media for a week of festivities designed to raise awareness of the Caribbean’s diverse tourism industry and provide opportunities for member destinations to promote their individual products and services, participate in meetings, seminars and other business development activities to further enhance the Caribbean brand, and provide updates and critical support to travel agents and the media who influence key travel demographics. Caribbean Week is supported by: Academy Engraving, American Express, Antigua and Barbuda, Barbados, Bedessee Sports The British Virgin Islands, Bloomingdale’s, Blue Waters, Calabash Cove Resort & Spa, Cayman Islands, Cititech Solutions, Coyaba Beach Resort, Cool Tech Air Conditioning and Refrigeration LLC, Delta Airlines, Dominica, Doctor’s Cave, Four Season Resort Nevis, Grace, Grenada, Half Moon, Haiti, Jamaica, James Beard Foundation, JetBlue, La Martinique, Ocean Terrace Inn, Round Hill Hotel and Villas, Sandals, St. Vincent and The Grenadines, Saint Lucia, The Wyndham New Yorker Hotel, Travel+Leisure, Williams-Sonoma. To participate in, or sponsor any Caribbean Week New York event, visit www.caribbeanweek.com; email [email protected] or call +1212-636-9350. CTO members receive special concessions when they participate in Caribbean Week New York. To find out more about membership visit http://bit.ly/alliedmembers or email [email protected]. BRIDGETOWN, Barbados (3 March. 2019) – For the first time since its introduction in 2003, influencers will be able to compete for an award in the Caribbean Tourism Organization (CTO) travel media awards programme this year. In keeping with social media trends and the organisation’s objective of recognising all media, the CTO has added the ‘I Have Influence’ award to the contest in recognition of the growing number of influencers who contribute to telling the Caribbean’s story. The ‘I Have Influence’ award will be given to the influencer judged to have executed the best campaign that has delivered results based on agreed objectives. Entrants will be required to submit a summary of the brief, the objectives and goals of the campaign or activity, any key performance indicators agreed to measure the success of the campaign, how the campaign was planned and what collaboration took place, any research undertaken, tools and technologies used and challenges that were overcome, the methodology used use executing the campaign, and how it satisfied the performance indicators. It was only last year that the CTO introduced two social media categories to the contest -the ‘Up the Social Ladder’ category for the best social media marketing campaign by a CTO member country and ‘Look, I’ve Gone Social’ for the most outstanding social media coverage of an event or activity by a journalist. Both categories will be part of this year’s awards programme. There are twelve categories altogether for this year’s awards, which will be presented at the Travel Industry Awards Dinner on Thursday 6 June during Caribbean Week New York. The deadline for the receipt of entries is Friday 5 April 2019. For further details, including the categories, the rules governing the contest and guidelines for submission, as well as to submit entries, visit www.onecaribbean.org or click on the following link: https://bit.ly/2XCqIlw. Organised by CTO-USA, Inc, Caribbean Week New York will take place from 1-8 June with a programme throughout New York City that includes key business meetings held at the Wyndham New Yorker Hotel. The week is designed to raise awareness of the Caribbean’s diverse tourism industry and further enhance the Caribbean region’s cultural tapestry. Combining exciting consumer-oriented and informative business sessions with Caribbean-inspired cuisine, lively entertainment, authentic cultural experiences and networking opportunities, Caribbean Week New York is the largest Caribbean tourism activity in the city. 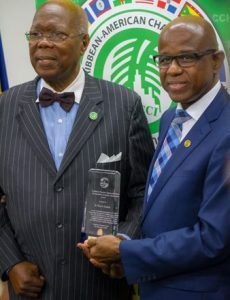 BRIDGETOWN, Barbados (4 August 2018) – Hugh Riley, secretary general of the Caribbean Tourism Organization (CTO) presented its “Distiguished Caribbean Citizen Award” to Dr. Roy A. Hastick, Sr., president and CEO of the Caribbean American Chamber of Commerce and Industry (CACCI), during a recent CACCI small business development power breakfast meeting. The honour is part of CTO’s Caribbean Tourism Industry Awards given annually during Caribbean Week New York festivities. NEW YORK, NY (25 May 2018) – Vibrant colours, authentic cuisine and Caribbean fashion will be on display in the Grand Ballroom at the Wyndham New Yorker Hotel as five Caribbean American designers and an exceptionally talented Caribbean chef will be featured during the Caribbean Tourism Industry Awards Dinner and Fashion Show on Thursday, 7 June 2018 from 6:30 p.m. – 10:00 p.m. as part of Caribbean Week New York 2018 (#CaribbeanWeekNewYork2018, #CWNY18) hosted by the Caribbean Tourism Organization (CTO). Rejuvenation – A Caribbean American Fashion Showcase will feature industry veteran Malchijah Hats from Guyana, d’Marsh Couture headed by Jamaican designer Glenroy March, Haitian fashion designer Berny Martin’s CatouWear, and high-end women’s brand apparel Fashion Sixty4’s Samanta Samuel from Trinidad and Tobago. The fashion show will be presented by JLC PRoductions, in association with EventsWorks and TSD Image. “For decades, the Caribbean has been a source of inspiration to fashion designers, movie makers and other artists globally, however, the creatives of the Caribbean have yet to capitalize, en masse, in their own vibrant creativity. Surely in this Year of Rejuvenation, we should all agree that the time has indeed come for the Caribbean to shore up its sustainable diversity and as a region, create economic empowerment through cultural development,” said Janice Lawrence-Clarke, Founder CAFE – Caribbean American Fashion Exchange™. The event will also feature the culinary masterpieces of Barbados native Chef Jason Howard. Chef Howard is marking his place in history as a modern Caribbean chef as he infuses the flavours of his native cuisine with French cooking techniques to create stunning, balanced, and thought-provoking dishes, known for vibrant colours and diverse textures. “CTO is committed to continuing to showcase the great cultural talent of the region, through food, music, fashion and many other expressions,” said Sylma Brown, director CTO-USA. “Caribbean Week is an important and perfect platform for destinations to seamlessly highlight the authentic and complex nature of the region. CTO is grateful for the opportunity to share with the world the work of a few of many of the region’s savvy designers and chefs during Caribbean Week,” Brown added. Caribbean Week New York 2018 will have a special feel this year as the Big Apple’s 8.5 million residents get a taste of the re-energising and rejuvenating power of Caribbean wellness. During the week-long event (3-8 June), the wellness theme will be incorporated into many activities, including a trade show and educational forum for travel agents on how to sell the Caribbean as a wellness destination. Registration details for all events can be found at http://www.onecaribbean.org/events-calendar/cwny-2018/. Caribbean Week is supported by: Academy Engraving, American Express, Anguilla, Anse Chastanet & Jade Mountain, Antigua & Barbuda, Arrivalist, Islands of the Bahamas, Barbados, Bloomingdale’s, Caribbean Airlines, Cayman Islands, Cholula Food Company, Cititech Solutions, Club Med, Delta Air Lines, Doctor’s Cave, Dominica, Empire State Building, GoGo Vacations, Grace Foods, Grenada, Haiti, Half Moon, Jamaica, JetBlue, Ka’ana Resort and Spa, Manhattan Beer Distributors, Martinique, Saint Lucia, Seaborne Airlines, Sheraton-Puerto Rico, Sugarcane Restaurant, Travel + Leisure, Travel Impressions, TripAdvisor, Unique Vacations/Sandals, West Indian American Day Carnival Association (WIADCA), and William Sonoma. Media Sponsors: Meredith Travel Group, UBC Network, and Zee TV. To participate in, or sponsor any Caribbean Week New York event, visit www.caribbeanweek.com; email [email protected] or call (212) 635-9350. NEW YORK, NY (29 May 2018) – Travel and tourism suppliers, agents and distributors will come together at the Caribbean Tourism Organization’s (CTO) Trade Show and Educational Forum for Travel Agents as part of Caribbean Week New York 2018 (#CaribbeanWeekNewYork2018, #CWNY18). The event for travel professions is by invitation only and will take place Tuesday, 5 June 2018, from 5:30 – 9 p.m. at the Wyndham New Yorker Hotel (481 Eighth Avenue). Tying in with CTO’s “Year of Wellness and Rejuvenation” for 2018, the high-profile event is themed “Selling Wellness Travel” and will showcase why the Caribbean is the premier region for health and wellness – practices that have become increasingly important in societies around the world. Event attendees will get insight into this market segment from Sandra Ramani, senior contributing editor, Organic Spa Media Ltd. Celebrating her tenth year with the publication, Ramani has been covering spa, beauty, wellness, travel and lifestyle topics for over 18 years. Previously she served as a spa/beauty editor for New York Magazine and as editor-in-chief of Premier Traveler magazine. In keeping with CTO’s objective of providing travel agents with the tools that will help keep the Caribbean top-of-mind when discussing travel options with clients, this forum will feature several Caribbean destinations sharing information on their diverse wellness products – a market segment that can present significant financial rewards for agents who are knowledgeable and able to develop packages that appeal to a wider audience of well-connected discerning affluent travellers. The event is designed to give suppliers and destination representatives the opportunity to highlight what is special about their product and share relevant information, tips and trends with travel agents who work with leading tour operators with a heavy concentration on Caribbean travel. “During the trade show and educational forum, public and private sector exhibitors will showcase the diverse product that currently exists in the region which explains why the Caribbean should be a major player in wellness tourism,” noted Brown. Travel agents will hear from representatives from Antigua and Barbuda, Islands of the Bahamas, British Virgin Islands, Cayman Islands, Caribbean Airlines, Club Med, Dominica, GoGo Vacations, Grenada, Jamaica, Martinique, Saint Lucia, St. Vincent & the Grenadines, Travel Impressions and Unique Vacations/Sandals and Beaches. Further solidifying the importance of this event for both agents and suppliers, more than 80 specially selected qualified travel agents from databases of the top-producing tour operators for Caribbean travel have registered for the event. Only a few slots are still available. Participation fees for exhibitors are $995 (government members); $1,045 (non-government members); and $900 for small hotels (under 50 rooms). For more information or to register to exhibit, click HERE. NEW YORK, NY (17 May 2018) – Caribbean colours will decorate the New York City skyline on Wednesday, 6 June when the Empire State Building honours the region by lighting its world-famous tower in purple, blue, green, orange, red and magenta (pictured from 2017) in celebration of the Caribbean Tourism Organization’s (CTO) Caribbean Week New York 2018 (#CaribbeanWeekNewYork2018, #CWNY18). “It is an honour that the famous New York City skyline will be colourfully adorned in celebration of Caribbean Week,” Sylma Brown, the director of CTO-US, said. “We appreciate the on-going support of this annual series of events by lighting the iconic building in the Caribbean’s traditional colours,” she added. New Yorkers and visitors to the city can share their photos of the Caribbean-themed Empire State Building with CTO via social media using the hashtag #CWNY18 and tagging CTO’s accounts on Facebook, Twitter and Instagram as well as the Empire State Building’s pages across Facebook , Instagram and Twitter. Caribbean Week New York 2018 will have a special feel this year as the Big Apple’s 8.5 million residents get a taste of the reenergizing and rejuvenating power of Caribbean wellness. During the week-long event (June 3 – 8), the wellness theme will be incorporated into many activities, including a trade show and educational forum for travel agents on how to sell the Caribbean as a wellness destination. Registration details for all events can be found at http://www.onecaribbean.org/events-calendar/cwny-2018/. Caribbean Week is supported by: Academy Engraving, American Express, Anguilla, Anse Chastanet & Jade Mountain, Antigua & Barbuda, Arrivalist, Islands of the Bahamas, Barbados, Caribbean Airlines, Cayman Islands, Cholula Food Company, Cititech Solutions, Club Med, Delta Air Lines, Doctor’s Cave, Dominica, Empire State Building, GoGo Vacations, Grace Foods, Grenada, Haiti, Half Moon, Jamaica, JetBlue, Ka’ana Resort and Spa, Manhattan Beer Distributors, Martinique, Saint Lucia, Seaborne Airlines, Sheraton-Puerto Rico, Sugarcane Restaurant, Travel + Leisure, Travel Impressions, TripAdvisor, Unique Vacations/Sandals, West Indian American Day Carnival Association (WIADCA), and William Sonoma. Media Sponsors: Meredith Travel Group, UBC Network, and Zee TV.